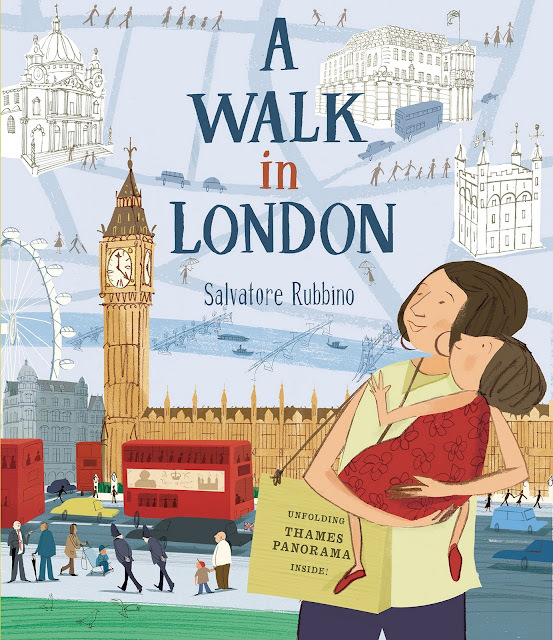 A Walk in London by Salvatore Rubbino is like an updated version of one of Miroslav Sasek's This Is... series of picture books written in the 1950s and 1960s. 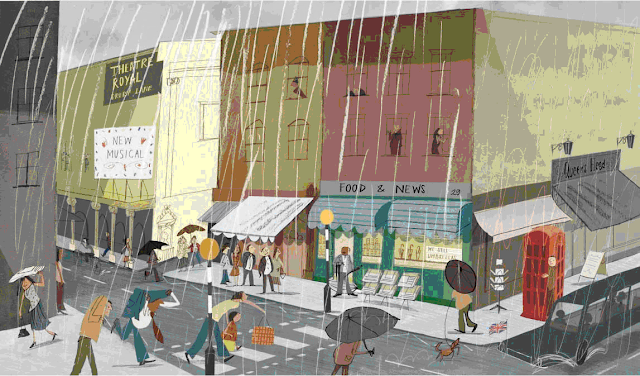 This Is London takes the reader on a child's eye view of London with crisp and colorful illustrations. Rubbino takes a similar loving, detailed walk through his hometown hitting all the highlights with children in mind with a fantastic four page fold-out of the Thames. A Walk in London is narrated by a little girl who is visiting the city with her mother. They get off the bus in Westminster where Big Ben tells them it's eleven am. Although you can't see it in the illustrations here, Rubbino sprinkles his artwork with facts about the city, which is superb. You can read just the narrative to younger listeners with shorter attention spans. For listeners who can sit for a longer story, the facts make the city even livelier. Buckingham Palace, Trafalgar Square, Covent Garden Piazza and St Paul's Cathedral are all part of the tour. Along the way we learn that 300 million servings of fish and chips are eaten by Brits every year, that London is Europe's rainiest city and that it is sometimes called the Square Mile because that's how big the city is. The four page fold-ut of the Thames reveals and amazing aerial view of the river and all the important sights along it and is a lovely way to wrap up the tour of the city. Threadneedle Street, the Tower of London and a ferry back to Westminster round out the day. As the day draws to a close, our narrator and her mother wave to the royal family driving past in a fancy black car. 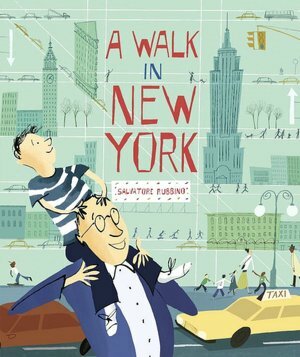 Rubbino has also written the wonderful A Walk in New York. I hope he has a few more cities to visit - there is always more room on the shelves for fantastically illustrated, non-fiction books about great cities.